Temporal data of daily intervals or higher frequency levels can be organised into a calendar-based format, which is useful for visually presenting calendar-related activities or multiple seasonality (such as time of day, day of week, day of month). The function only returns a rearranged data frame, and ggplot2 takes care of the plotting afterwards. It allows more flexibility for users to visualise the data in various ways. A data frame or a grouped data frame including a Date variable. A bare (or unquoted) variable mapping to x axis, for example time of day. If integer 1 is specified, it simply returns calendar grids on x without transformation. A bare (or unquoted) variable or more mapping to y axis. More than one variable need putting to vars(). If integer 1 is specified, it returns calendar grids on y without transformation. A Date variable mapping to dates in the calendar. Type of calendar. (1) "monthly" calendar (the default) organises the data to a common format comprised of day of week in the column and week of month in the row. A monthly calendar is set up as a 5 by 7 layout matrix. Each month could extend over six weeks but in these months is to wrap the last few days up to the top row of the block. (2) "weekly" calendar consists of day of week and week of year. (3) "daily" calendar refers to day of month and month of year. Direction of calendar: "h" for horizontal (the default) or "v" for vertical. Day on which week starts following ISO conventions - 1 means Monday (default), 7 means Sunday. You can set lubridate.week.start option to control this parameter globally. Number of rows and columns defined for "monthly" calendar layout. If NULL, it computes a sensible layout. FALSE (the default) for Cartesian or TRUE for polar coordinates. "fixed" (the default) for fixed scale. "free" for scaling conditional on each daily cell, "free_wday" for scaling on weekdays, "free_mday" for scaling on day of month. Numerics between 0 and 1 to specify the width/height for each glyph. Numerics of length two between 0 and 1 to specify the horizontal and vertical margins between month panels. A "ggplot" object or "plotly". If "label" is specified, it will add month/week text on the ggplot object, which is actually passed to geom_label(). If "text" is specified, it will add weekday/day of month text on the ggplot object, which is actually passed to geom_text(). By default, both "label" and "text" are used. 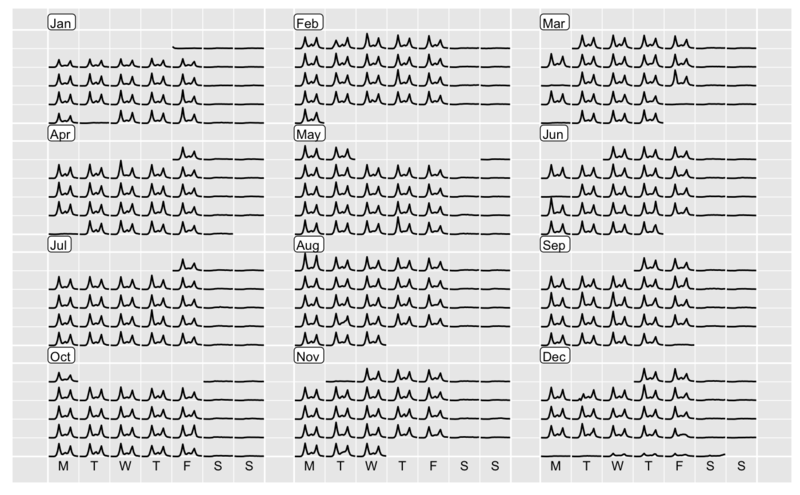 If "text2" is specified for the "monthly" calendar only, it will add day of month to the ggplot object. ISO 639 language code. The default is "en" (i.e. US English). For other languages support, package readr needs to be installed. See readr::locale for more details. Logical to specify if the abbreviated version of label should be used. A data frame or a dplyr::tibble with newly added columns of .x, .y. .x and .y together give new coordinates computed for different types of calendars. date groups the same dates in a chronological order, which is useful for geom_line or geom_path. 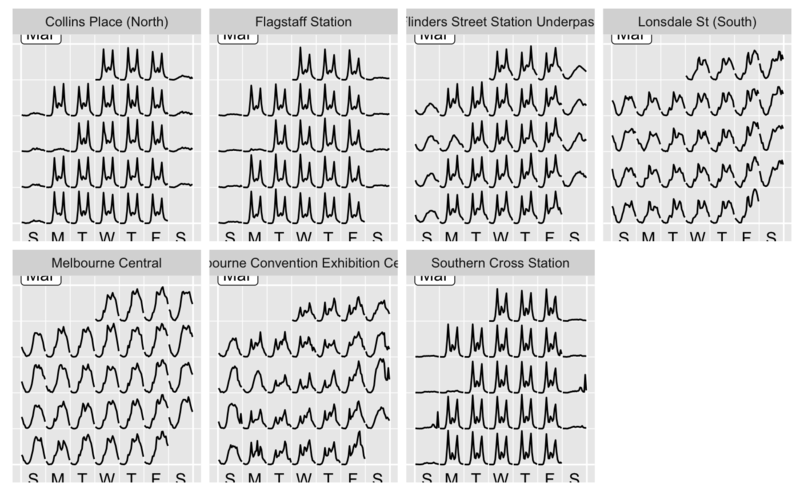 The basic use is ggplot(aes(x = .x, y = .y, group = date)) + geom_*. The variable names .x and .y reflect the actual x and y with a prefix ..
facet_calendar for a fully-fledged faceting calendar with formal labels and axes.